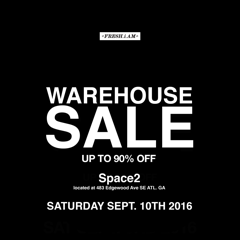 +FIA+’s warehouse sale is coming up soon. All previous seasons t­shirts, hats, hoodies, jackets, shorts, sample pieces and more will be marked down up to 90% off. The Analog Shop will be closed on September 10th on this ONE­DAY​ only event. All sales are ​FINAL​ so come shop at ​Space2​ from ​1­5pm​. Cards and cash will be accepted. ONE­DAY​ only event. All sales are ​FINAL​ so come shop at ​Space2​ from ​1­5pm​.